1Experimental Physics Labs, National Centre for Physics, Quaid-i-Azam University, Islamabad, Pakistan; 2Materials Science Laboratory, Department of Physics, Quaid-i-Azam University, Islamabad, Pakistan. Received July 27th, 2009; revised September 12th, 2009; accepted September 17th, 2009. In this article, we have given a review of thallium based (TlmBa2Can-1CunO2n+2) and copper based (CuBa2Can-1 CunO2n+4) high temperature superconductors. This review article is based on the methods of preparation in the form of bulk and thin films and their physical properties. We have also studied the sources of anisotropy and methods of lowering it via changing the composition of charge reservoir layer and developing a better inter-plane coupling. One of the general features of high temperature superconductors is the anisotropy parameter [g=rc/rab=xab/xc] which comes from their layered structure. The technological critical temperature and irreversibility field which play very important role in the use of high Tc superconductors in various applications are strongly related to the anisotropy parameter as Z==Tc/g and Hirr=Hc2/g respectively The understanding of the sources of anisotropy in these layered cuprates is essential to accomplish the direly needed isotropic superconductor; i.e. like BCS superconductor. Therefore, it is very important to search for a superconducting material which has higher critical temperature, Tc, critical current density and as well as lower anisotropy. The thallium based superconductors TlmBa2Can-1CunO2n+2 (m=1, 2; n=1, 2, 3, 4, 5) are superior over other cuprates due to their higher Tc, Jc, Hirr and low microwave surface resistances. The maximum critical temperature achieved in both the families of thallium based superconductors is 123K and 127K and current densities are of the order of 106 A/cm2. 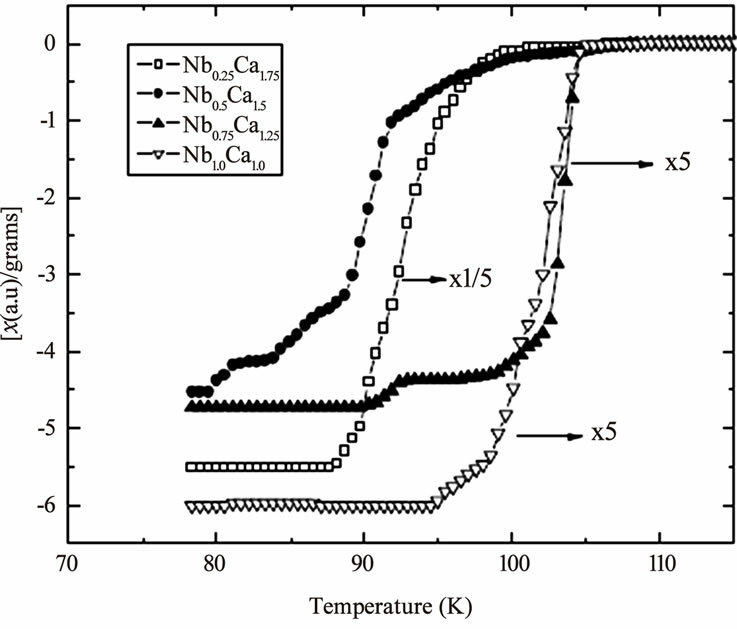 Another family of oxides which has comparable superconducting characteristics as thallium based compounds but with lower anisotropy is CumBa2Can-1CunO2n+2 (m=1 n=1, 2, 3, 4, 5). The major disadvantage associated with these superconductors is their preparation under very high pressures i.e. 4GPa, which makes their large scale production difficult. 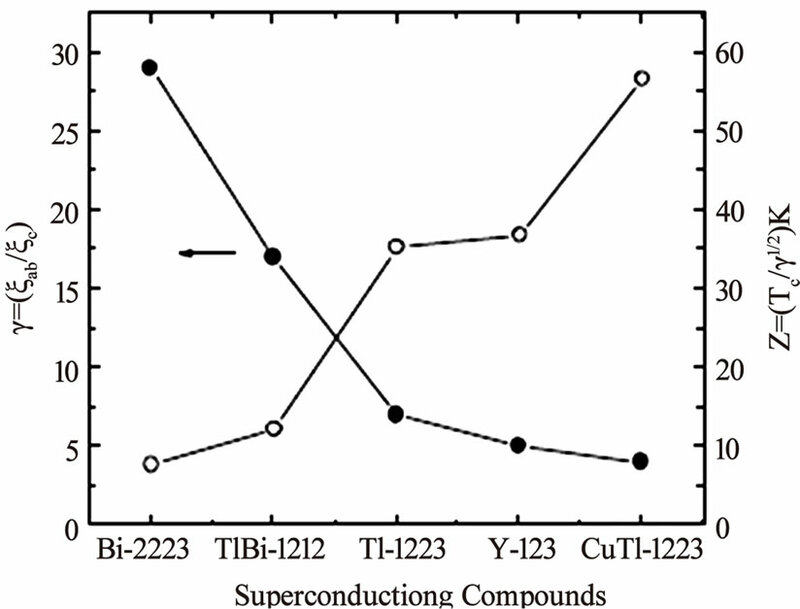 However, the superconducting properties of TlmBa2Can-1 CunO2n+2 and CumBa2Can-1CunO2n+2 are combined in a new superconductor family which is represented as (Cu1-xTlx)Ba2Can-1CunO2n+2. These superconductors are prepared at normal pressure by substituting thallium at copper site in CumBa2Can-1CunO2n+2 superconductors. These superconductors have anisotropy parameter (g=3-11) in between that of Cu and Tl based superconductors. In this article we have first reviewed the methods of preparation and physical properties of thallium based superconductors and then the copper based superconductor. We have also shown that the Tl-1223 as well Cu-1223 superconductors is more promising members of their families. 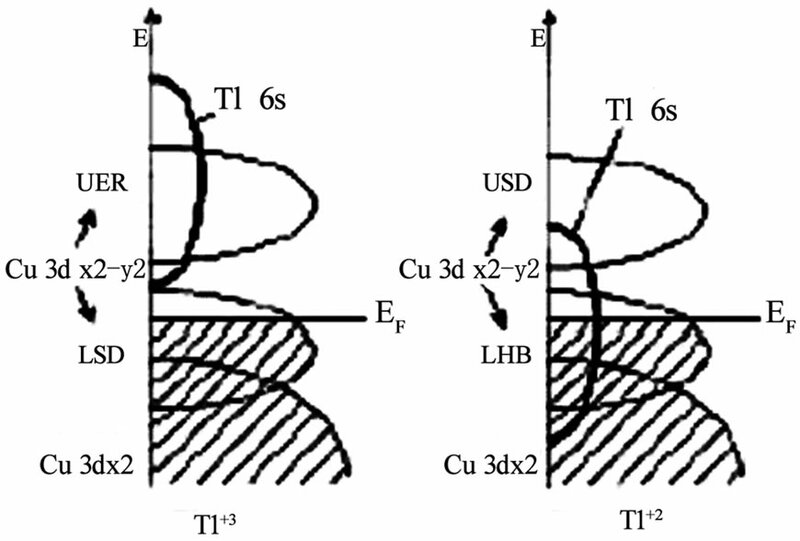 At the end the end of the article the superconducting properties of (Cu1-xTlx) Ba2Ca2Cu3O10-d are given. The thallium based Tl-Ba-Ca-Cu-O (TBCCO) superconductor was discovered in 1988 by Sheng and Hermann [1,2–6] which is proven to be the best among all other cuprates due to their higher transition temperature, [Tc(0)], transport critical current densities, [Jc] and low microwave surface resistances, [Rs]. Since the discovery of superconductivity in this system, several new phases of TlmBa2Can-1CunO2n+2 (m=1, 2; n=1, 2, 3, 4, 5) have been synthesized [7,8–10]. In the two-layer thallium compounds, the Tl2Ba2Cu1O6, Tl2Ba2Ca1Cu2O8, Tl2Ba2 Ca2Cu3O10, Tl2Ba2Ca3Cu4O10, and Tl2Ba2Ca4Cu5O8 are major phases, which can be simply represented as, Tl-2201, Tl-2212, Tl-2223, Tl-2224 and Tl-2245 with critical temperatures of 95, 118, 127, 112 and 105K respectively. 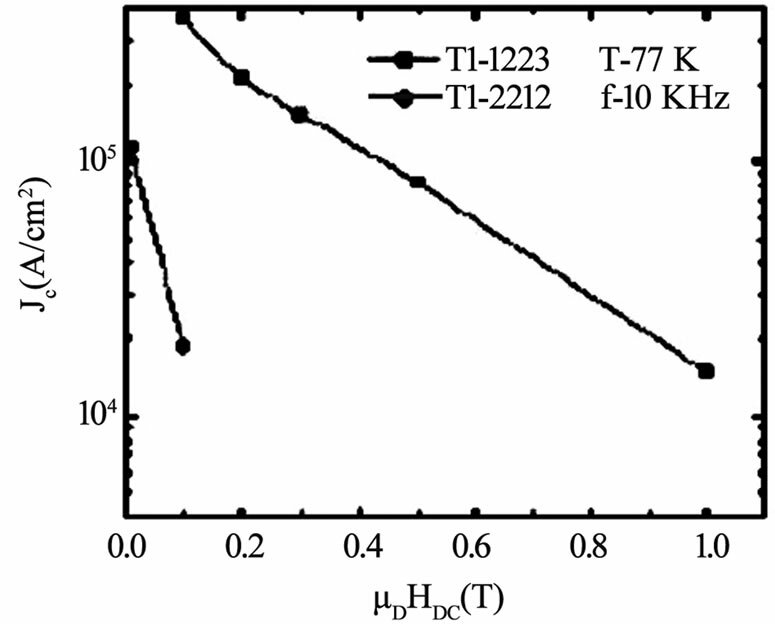 The maximum critical temperature of ~127K is found in Tl-2223 superconductor [11,12]. On the other hand the monolayer Tl-based system includes TlBa2Ca1Cu2O7, Tl1Ba2Ca2Cu3O9, TlBa2Ca3Cu4O11, and Tl Ba2Ca4Cu5O13 superconductor phases, which for brevity can be represented as Tl-1212, Tl-1223, Tl-1234 and Tl-1245 with critical temperatures 103, 123, 112 and 107K respectively. The materials with double Tl-O layers have body centered tetragonal structure and single Tl-O layer compounds have primitive tetragonal structure. 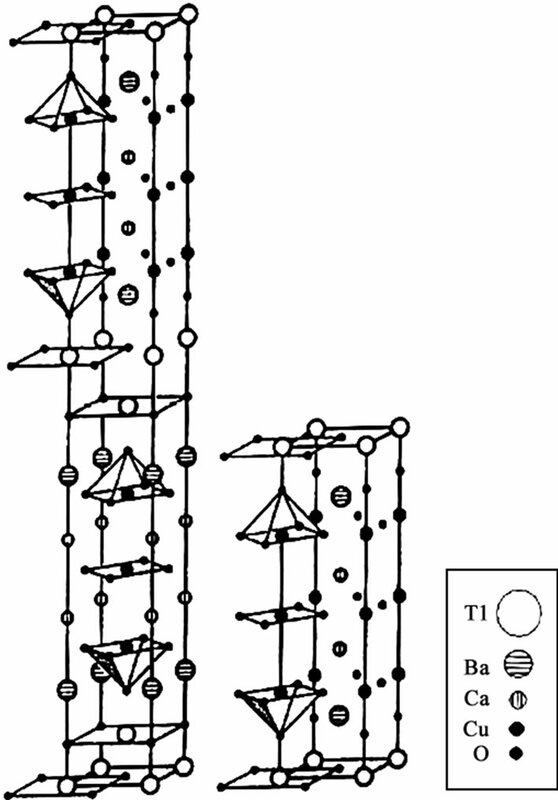 The crystal structures of Tl-2223 and Tl-1223 superconductors are shown in Figure 1. A brief review of thallium-based superconductors will be given in the following sections. 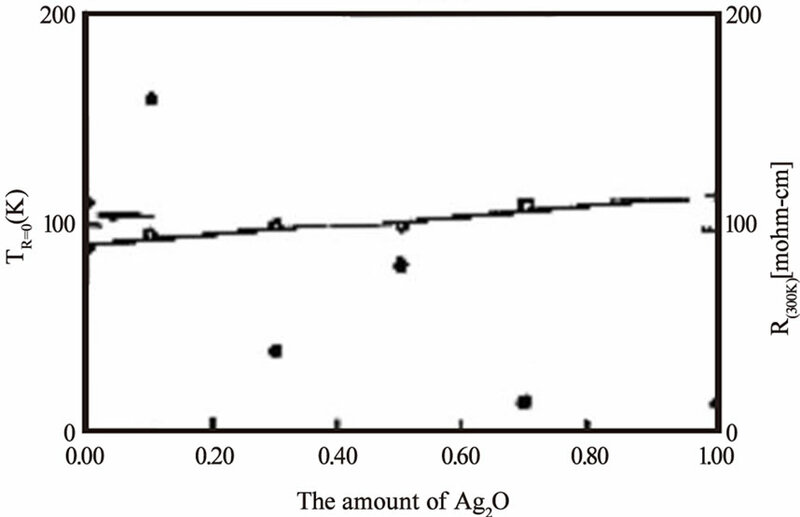 Ag2O doping concentrations. 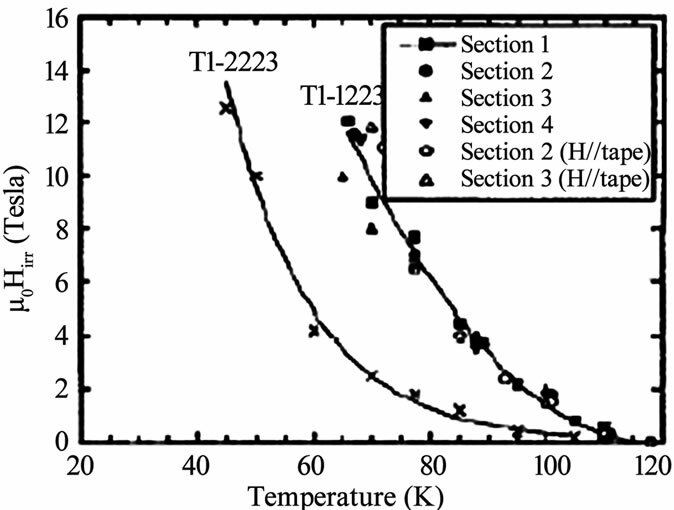 The doping of Li in Tl- 2223 starting composition results in a critical temperature of 117K and the normal state resistivity becomes independent of the applied magnetic fields . Since the maximum Tc(0) in a given compound also strongly depends on the interlayer coupling so the external pressure can be used as a source to improve the superconducting properties intrinsically. The application of pressure contracts the Cu-(apical) oxygen bond length which favors the transfer of carriers from the charge reservoir layer to CuO2 planes. D. Tristan et al. 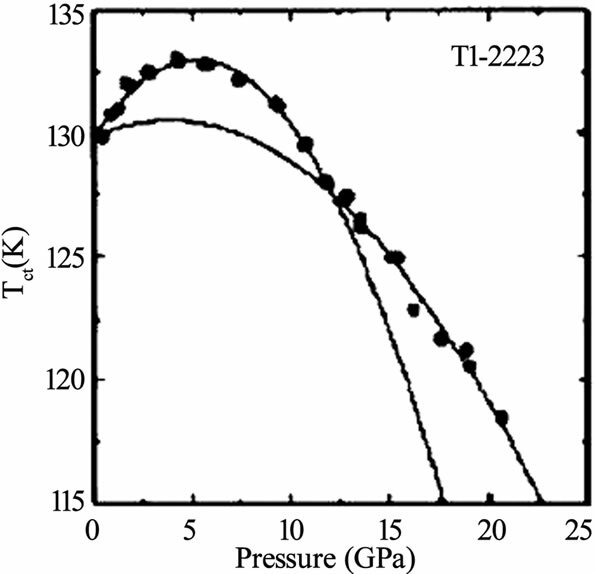 have studied the properties of Tl-2223 and Tl-2234 superconductors under different pressures and found that the critical temperature (~119K) of Tl-2223 sample prepared under ambient pressure is increased to 133K when 4.2GPa pressure was applied . 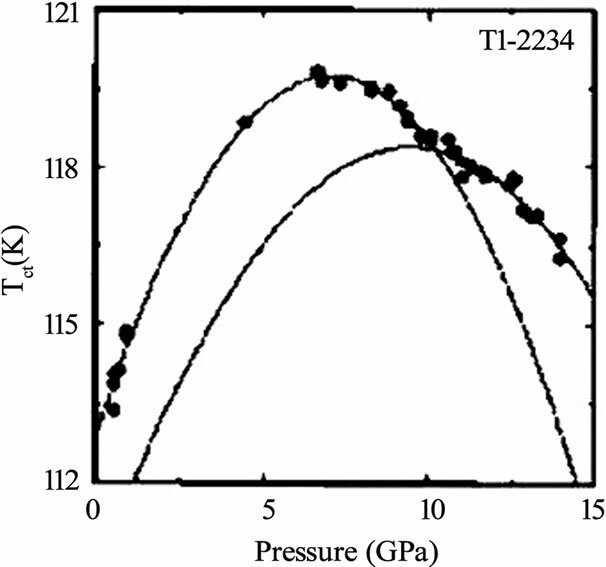 The change in the critical temperature of Tl-2223 and Tl-2234 with applied pressure is shown in Figure 5. The reliable, high quality thin films are prerequisite for the use of thallium based high temperature superconductors for electrical, magnetic and optical applications. The methods of preparation of thin films include rf and dc sputtering, sequential electron beam and thermal evaporation, and pulsed laser ablation. The highest critical current density in double layer TlO compounds is attained in Tl-2223 thin films, which is of the order of 107 A/cm2 (90K, 0T) . On the other hand the critical current density of Tl-2212 superconductor is in the range of 105-106 A/cm2 at 77K depending upon the deposition techniques used [42–46]. in the starting composition of Tl-1223 enhances the formation of single phase Tl-1223 material with out any Pb or Srdoping and increases Jc(77K, 0T) and irreversibility field Hirr [90,91]. The thin films of Tl-1223 prepared by using TlF are found to have critical current density of 4.4´106 A/cm2 at 77K in zero field . Since the ionic radius of fluorine [F-1(1.36Å)] is comparable to that of oxygen [O-2(1.4 Å)] so fluorine most probably occupies the oxygen lattice site in the unit cell . The holes concentration in the CuO2 planes decreases when fluorine replaces oxygen in the Tl-1223 superconductor because of the more electronegative nature of F ion as compared to oxygen . 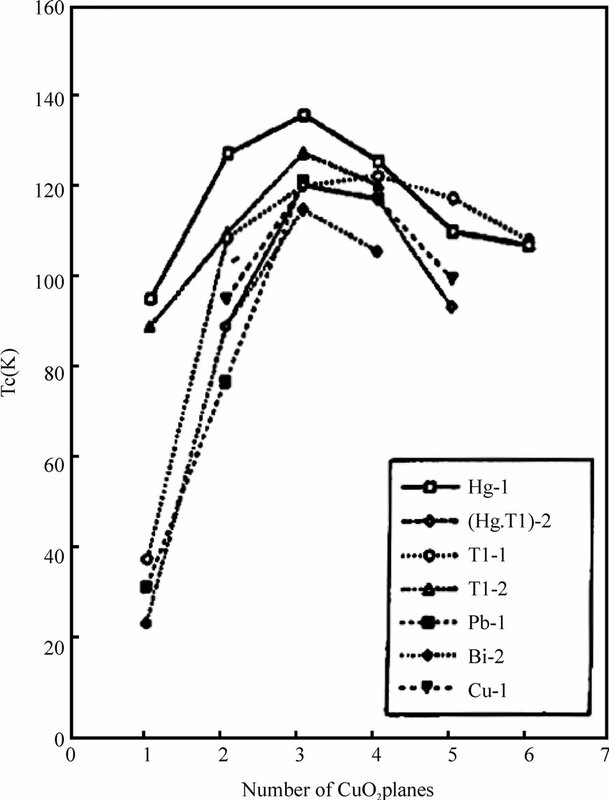 The carrier concentration approaches optimum level and Tc(0) is increased. In Tl(Pb)Ba(Sr)Ca CuOFx composition, the critical temperature has been enhanced with fluorine contents up to x=1 and a pure Tl-1223 phase with highest Jc was achieved with x=3 . The samples of TBCCO (Tl-1223) superconductors with more than 95% purity can also be obtained by choosing the appropriate synthesis temperature and controlling the reaction time with out any substitutions . Although most of the substitutions in Tl-1223 superconductors were made to improve the phase stability of these compounds but these doping can also control the carrier concentration and in turn the superconducting properties of these compounds. The rare earth cations (La, Sm, Pr, Eu) substitutions at the Ca sites in Tl-1223 superconductors have been found to lower the critical temperature and the phase stability of this compound [95–99]. But when one of the rare earth elements Ce was doped at Sr site the critical temperature was increased from 92K to 98K with the increased concentration of cerium. The increase in Tc(0) was attributed to the improved coupling between the CuO2 planes due to the decreased c-axis length . The critical temperature and the critical current density of Tl-1223 superconductor decreases with low level doping concentration of 3d transition metals Co, Zn, Fe and Ni at Cu site and superconductivity disappears for higher concentrations of these elements [101–104]. The presence of these ions in CuO2 planes acts as scattering centers, which resulted in the Cooper pair breaking, and destroys the superconducting state in Tl-1223 compounds. When the transition metal ions are substituted at the Tl site in the charge reservoir layer of Tl-1223 superconductor the critical temperature was decreased following the same mechanism mentioned earlier . The thin films of thallium based superconductors are of interest for electronic devices due to their higher Tc(0) and low surface resistance Rs . Among the thallium-based compounds the thin films of single TlO layer materials (Tl-1223) are superior because of their higher Tc(0) and Jc . Thin films of Tl-1223 superconductors have critical current density in the range of 105-106 A/cm2 at 77K (both in field cooled and zero field cooled samples) depending upon the deposition technique adopted [47,66,84,107–109]. The Tl-based high Tc cuprates exhibit layered structure which consists of intergrowths along c-axis containing CuO2 planes and rock salt type layers containing Tl cations. The insulating Tl-O layers separate the CuO2 blocks in the crystal. The CuO2 planes are found to be more favorable for superconductivity as compared to insulating charge reservoir block containing single or double Tl-O layers . The superconducting properties like critical temperature, irreversibility field, critical current density and flux pinning in thallium-based compounds largely depend on the thickness of the insulating Tl-O layer and the strength of Josephson coupling between CuO2 planes [23,49,50,53,111–115]. The presence of the Tl-O layers between the CuO2 superconducting blocks yields anisotropy in the physical properties of these compounds. The anisotropy parameter is defined by γ=ξab/ξc, γ=ρc/ρab or is the ratio of the effective carrier mass in the superconducting state. The anisotropy in these superconductors results in a shorter coherence length of cooper pairs along c direction as compared to the spacing between the CuO2 layers which can reduce the critical current density and irreversibility field of these materials. The anisotropy parameter depends on the thickness of the insulating charge reservoir layer and the spacing between the individual CuO2 planes, the Tlbased compounds with double Tl-O layers in the structure have large anisotropy as compared to the compounds with single Tl-O layer (γ=17 for (TlBi)-1212 and γ=104 for Tl-2212). The higher anisotropy degrades the superconducting properties in terms of lower technological critical temperature, Z=Tc/g1/2, critical current density Jc and irreversibility field, Hirr. The Hirr is an important physical quantity that characterizes a superconductor for its use in magnetic fields. The irreversibility field largely depends on the inter layer coupling strength . where dc is the repeat distance of the structure along c direction and ρc µ exp (di/do) di is the thickness of the insulating layer and do is the characteristic thickness of the material. The exponential dependence of Hirr on di shows that superconducting materials with large insulating spacing exhibit low irreversibility filed than the materials with smaller insulating spacing [53,116,117]. The irreversibility field ‘Hirr’ of Tl-1223 superconductor follows the sequence; Hirr(Tl-1223)>Hirr(Tl-2223/Tl-2212)> Hirr(Bi-2212) [116,117]. 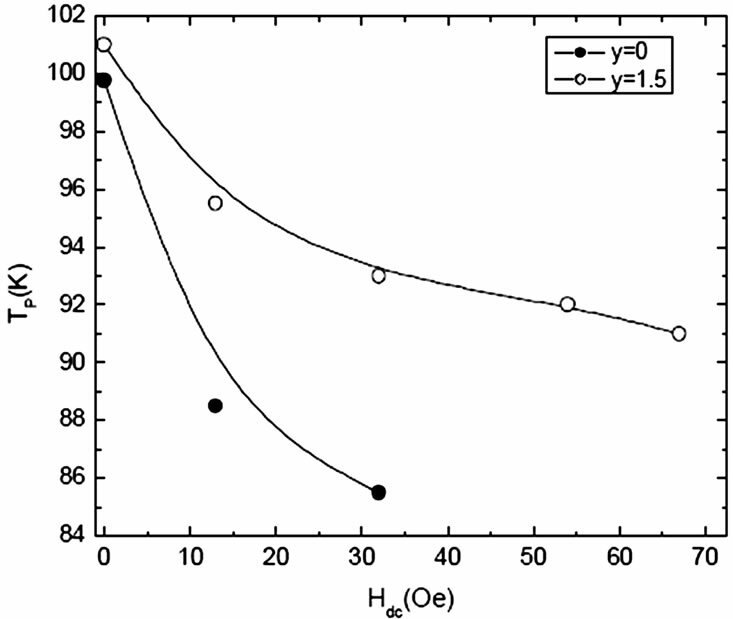 Figure 10 shows the comparison of irreversibility line of Tl-1223 and Tl-2223 superconductors and in Figure 11 the dependence of Hirr on the thickness of the unit cell along c-axis for different Tl-based compounds is shown. 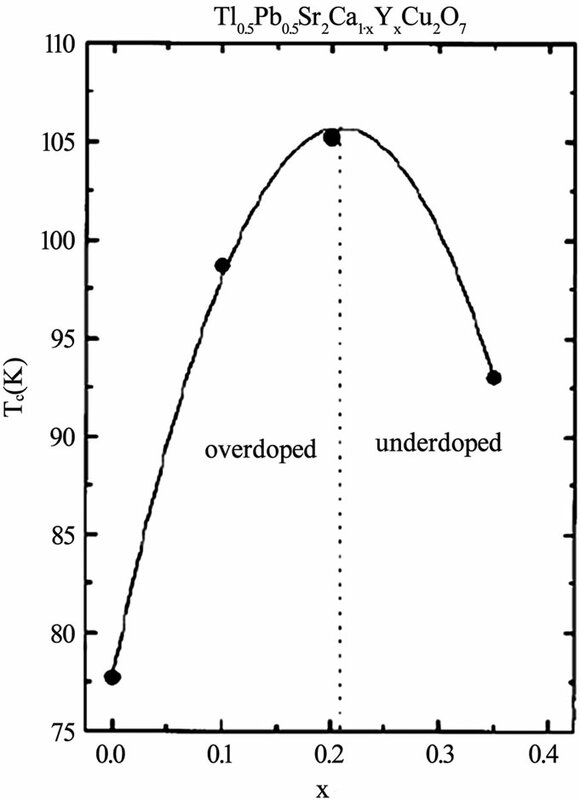 A higher irreversibility line is observed for Tl-1223 due to its lower anisotropy. 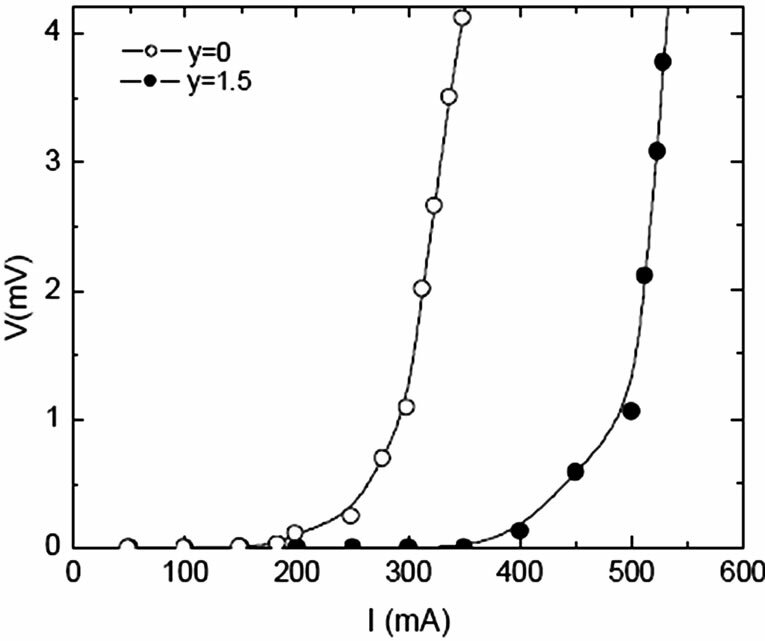 The measured anisotropy parameter γ for Tl-1223 superconductors is 8 . The interlayer coupling can also affect the critical current density of these superconductors. The Tl-1223 superconductors have been found to have higher Jc as compared to Tl-2212 and Tl-2223 compounds [47,49,50]. The Tl-1223 superconductors are very useful in electronic devices fabrication because the critical currents in these compounds decreases slowly as compared to double Tl-O layer compounds in the presence of external magnetic fields [47,55]. In Figure 12, a comparison of the magnetic field dependence of Jc(77K) of Tl-1223 and Tl-2212 is shown. The increase in the number of insulating layers in superconductors results in reduced Josephson coupling between conducting CuO2 planes along the c-axis, which decreases the critical current density. The reduced interlayer coupling in double Tl-O layer compounds results in a shorter coherence length of cooper pairs along c-axis and hence the inferior superconducting properties. The small distance between Cu-O conducting planes may be the key to finding alternatives for attaining high critical current densities. Therefore, much attention is being given to Tl-1223 superconductors because they offer stronger interlayer coupling along c direction . The coupling between CuO2 planes of Tl-1223 compound can further be improved by replacing Ba by Sr and Tl by Pb or by the application of the external pressure which will be helpful in enhancing its superconducting properties [25,76]. As the stronger coupling between CuO2 planes lowers the anisotropy in high temperature superconductors and in turn enhances their superconducting properties i.e. Tc(0), Jc and Hirr, any superconducting material having these properties will be very useful from application point of view. In the previous sections we have seen that the Tl- 1223 superconductor has least anisotropy and higher Tc(0) among all members of single Tl-O layer compounds, but the toxicity of Tl hinders their use in wide verity of applications. Therefore, the search for a superconductor material with low anisotropy and higher critical temperature was not stopped. A new family of superconductor materials, CuBa2Can-1CunO2n+2(n=1,2,3…) [Cu-12(n-1)n] prepared under high pressure (4-6 GPa), is thought to be the most promising due to its higher critical temperature and critical current density [118–124]. The members of Cu-12(n-1)n family has the same tetragonal structure as Tl-12(n-1)n compounds have copper in their charge reservoir layer, CuBa2O4n+δ. Since copper is good conductor, therefore, the conducting charge reservoir layer of these compounds makes them least anisotropic as oppose to Tl-based superconductors. The members of Cu-based superconductors follow the formula Cu-12(n-1)n with n denoting the number of conducting CuO2 planes; the higher number of CuO2 planes are thought to have higher Tc(0) since the optimum valency of copper for higher critical temperature is suggested to be z=2.33. The maximum increase of critical temperature is theoretically predicted for phase with n=11 . The relationship between valence state z of copper and number of CuO2 layers follows following empirical rule z=2+4/(n+1) Among all the superconducting phases in this family the highest critical temperature is achieved in a phase with n=3 phase, Cu-1223 (Tc(0)~120K); in four CuO2 plane Cu-based superconductor (Cu-1234) Tc(0) is around 18K. These two compounds have least anisotropy (γ=5 and 1.6 respectively) and long coherence length along c-axis [123–126]. The high-pressure synthesis of these compounds is not economically viable but by introducing thallium (which acts as structure stabilizer and reaction rate accelerator) into the charge reservoir layer, the superconductor phases can easily be obtained by normal pressure synthesis. The substitution of Tl in Cu-12(n-1)n compounds results in emergence of a new subfamily Cu1-xTlx-12(n-1)n which is the close derivative of these compounds. These compounds are prepared under high as well as normal pressure and have superconducting properties very close to Cu-based compounds [124,127–130]. The members of this family have semi insulating charge reservoir layer Cu1-xTlxBa2O4n-δ which slightly increases the anisotropy but their anisotropy remains lower than that of Tl-based compounds. 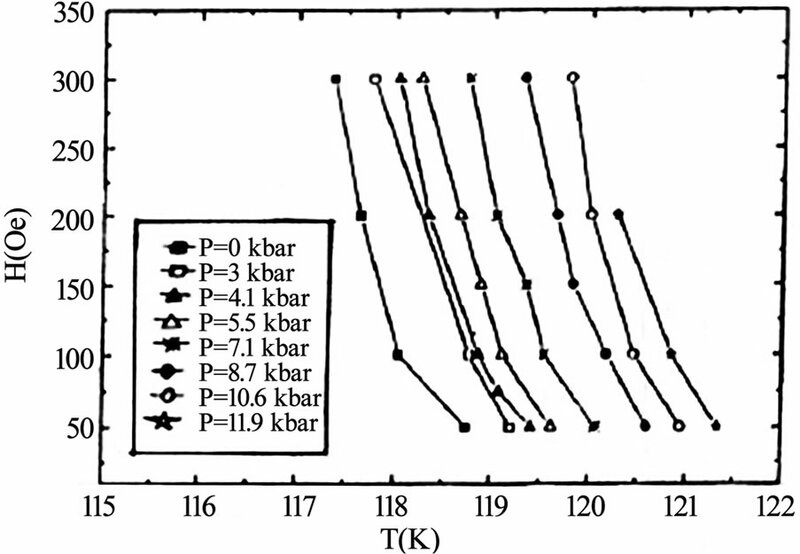 A comparison of the anisotropy parameter and technological critical temperature for superconductors of different families is shown in Figure 13. The Cu1-xTlxBa2Ca2Cu3O10-δ (Cu1-xTlx-1223) superconductor of this family has higher critical temperature and critical current density . This compound with anisotropy parameter (γ=5) has Cu1-xTlxBa2O4-δ charge reservoir layer and three CuO2 planes . The c-axis length of Cu1-xTlx-1223 is 15.89Å, which, lies between 14.79Å and 15.93Å of Cu-1223 and Tl-1223 superconductors . The Cu1-xTlx-1223 superconductor has been prepared both in the form of thin films and bulk samples [114– 133]. The thin films of this compound have critical current density of the order of 107 A/cm2 (77K, 0T) and 105 A/cm2 (77K, 10T) . The superconducting properties of Cu1-xTlx-1223 can further be enhanced by post-annealing and substitution of different cations [125,128,134–138]. 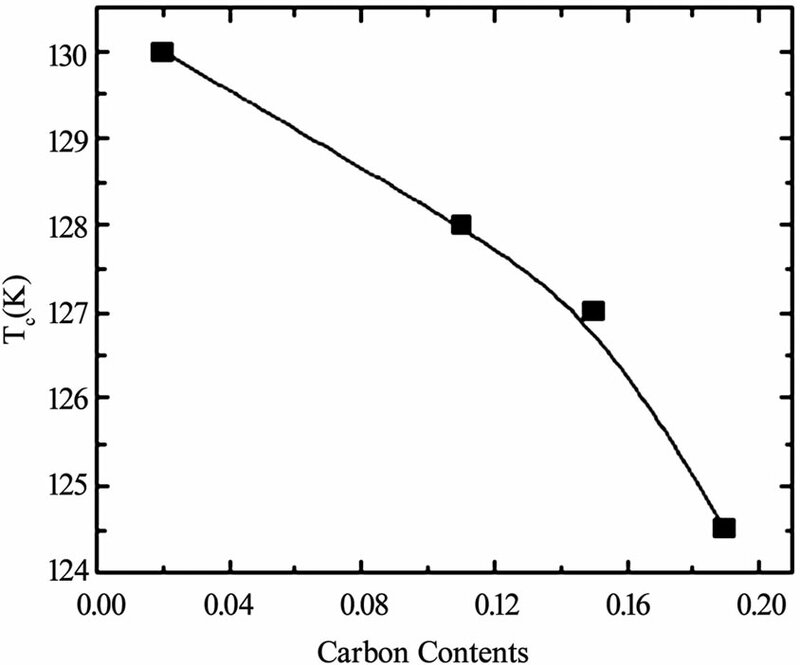 The Tc(0) of this material increases by self-doping mechanism when post-annealed in nitrogen atmosphere. The self-doping mechanism is completed by the reduction of Tl+3 to Tl+1 via Tl+2, Figure 14 [139–141]. the ability of significant Tc(0) enhancement by self doping  because it has carbon in the charge reservoir layer in contrast to Cu1-xTlx-1223 in which change of state of thallium promotes the optimum holes doping in CuO2 planes. It is concluded from the above detailed review of Tl-12(n-1)n and Cu-12(n-1)n compounds that the superconductors of these two families have low anisotropy as compared to other cuprate families. These compounds due to their lower anisotropy have the ability to carry very high current densities of the order of 104-106 A/cm2 in applied magnetic fields and have got potential in device fabrication. In both these families the higher critical temperature is achieved in a compound with n=3 member. The Cu-1223has lower anisotropy than that of Tl-1223 but its preparation is possible only under high pressure (4GPa). The high pressure synthesis hinders the preparation of this compound for large scale applications. 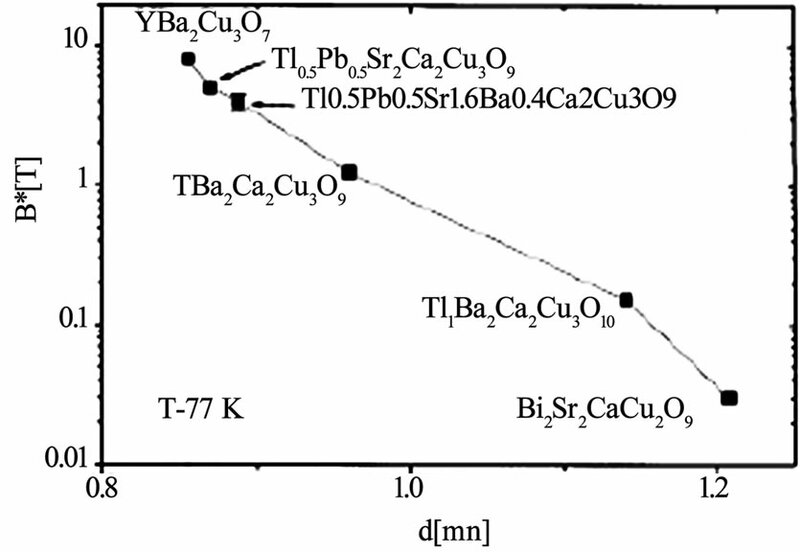 But the substitution of thallium at the copper site in the charge reservoir layer of Cu-1223 results in a new compound CuTl-1223, which has low anisotropy, higher critical temperature and critical current density. The substitution of thallium makes it possible to prepare this compound at normal pressure. We have also seen that the anisotropy of these compounds can be lowered by increasing the coupling between the CuO2 planes. The increased inter-plane coupling is achieved by substituting smaller sized elements at Ca site, such as Mg and Be. This review article would be useful in the understanding and synthesis of new superconductors with low anisotropy and would help to enhance their superconducting properties. Z. Z. Sheng and A. M. Hermann, Nature, Vol. 332, pp. 55, 1988. Z. Z. Sheng, A. M. Hermann, A. E. Ali, C. Almasan, J. Estrada, T. Datta, and R. J. Matson, Phys. Rev. Lett., Vol. 60, pp. 937, 1988. Z. Z. Sheng and A. M. Hermann, Nature, Vol. 332, pp. 138, 1988. Graziella Malandrino, Darrin S. Richeson, Tobin J. Marks, Donald C. De Groot, Jon L. Schindler, and Carl R. Kannewurf, Appl. Phys. Lett., Vol. 58, pp. 182, 1991. M. L. Chu, H. L. Chang, C. Wang, J. Y. Juang, T. M. Uen, and Y. S. Gou, Appl. Phys. Lett., Vol. 59, pp. 1123, 1991. W. L. Oslon, M. M. Eddy, T. W. James, R. B. Hammond, G. Gruner, and L. Drabeck, Appl. Phys. Lett., Vol. 55, pp. 188, 1989. M. Kikuchi, T. Kajitani, T. Suzuki, S. Nakajima, K. Hiraga, N. Kobayashi, H. Iwasaki, Y. Syono, and Y. Muto, Jpn. J. Appl. Phys., Vol. 28, pp. L382, 1989. S. S. P. Parkin, V. Y. Lee, E. M. Engler, A. I. Nazzal, T. C. Huang, G. Gormau, R. Savoy, and R. Beyer, Phys. Rev. Lett., Vol. 60, pp. 2539, 1988. I. K. Schuller and J. D. Jorgensen, Mater. Res. Bull. XIV, pp. 27, 1989. A. W. Sleight, M. A. Subramanian, and C. C. Torardi, Mater. Res. Bull. XIV, pp. 45, 1989. C. Martin, C. Michel, A. Maignan, M. Hervieu, and B. Raveau, C. R. Acad. Sci. Ser.2, Vol. 307, pp. 27, 1988. Chan Park and Robert L. Synder, J. Am. Ceram. Soc., Vol. 78, pp. 3171, 1995. J. B. Parise, J. Gopalkrishnan, M. A. Subramanian, and A. W. Sleight, J. Solid State Chem., Vol. 76, pp. 432, 1988. Y. Tang, B. Lin, D. Zhou, W. Zhu, F. Chen, N. Li, K. Chen, and G. Lu, Mod. Phys. Lett. B, Vol. 3, pp. 853, 1989. D. S. Ginley, J. F. Kwak, R. P. Hellmer, R. J. Baughman, E. L. Venturini, M. A. Mitchell, and B. Morosin, Physica C, Vol. 156, pp. 592, 1988. W. L. Olson, M. M. Eddy, T. W. James, R. B. Hammond, G. Gruner, and L. Drabeck, Appl. Phys. Lett., Vol. 55, pp. 188, 1989. W. Y. Lee, V. Y. Lee, J. Salem, T. C. Huang, R. Savoy, D. C. Bullock, and S. S. P. Parkin, Appl. Phys. Lett., Vol. 53, pp. 329, 1988. D. S. Ginley, J. F. Kwak, R. P. Hellmer, R. J. Baughman, E. L. Venturini, and B. Morosin, Appl. Phys. Lett., Vol. 53, pp. 406, 1988. K. K. Verma, G. D. Verma, R. S. Tiwari, and O. N. Srivastava, Jpn. J. Appl. Phys., Vol. 29, pp. L880, 1990. W. Y. Lee, J. Salem, V. Lee, D. Deline, T. C. Huang, R. Savoy, J. Duran, and R. L. Sandstrom, Physica C, Vol. 160, pp. 5117, 1989. H. L. Chang, C. Wang, M. L. Chu, T. M. Uen, and Y. S. Gou, Jpn. J. Appl. Phys., Vol. 28, pp. L631, 1989. H. S. Koo, W. M. Hurng, W. H. Lee, T. Y. Tseng, M. Chen, and J. R. Lo, Appl. Phys. Lett., Vol. 62, pp. 3354, 1993. D. Thopart, J. Hejtmanek, D. Pelloquin, C. Martin, and A. Maignan, Physica C, Vol. 336, pp. 143, 2000. Z. Zhang, C. C. Chen, C. M. Lieber, B. Morosin, D. S. Ginley, and E. L. Venturini, Phys. Rev. B, Vol. 45, pp. 987, 1992. D. T. Jover, R. J. Wijngaarden, R. Griessen, E. M. Haines, J. L. Tallon, and R. S. Liu, Phys. Rev. Lett., Vol. 54, pp. 10175, 1996. Ph. Galez, Th. Hopfinger, J. L. Soubeyroux, M. Lomello-Tafin, Ch. Opagiste, Ch. Bertrand, and J. L. Jorda, Physica C, Vol. 372, pp. 1137, 2002. S. H. Liou and C. Y. Wu, Appl. Phys. Lett., Vol. 60, pp. 2803, 1992. S. Matsuda, S. Takeuchi, A. Soeta, T. Suzuki, K. Aihara, and T. Kamo, Jpn. J. Appl. Phys., Vol. 27, pp. 2062, 1988. T. S. Kayed, Cryst. Res. Technol., Vol. 38, pp. 946, 2003. A. Soeta, T. Suzuki, S. Takeuchi, T. Kamo, K. Usami, and S. Matsuda, Jpn. J. Appl. Phys., Vol. 28, pp. L1186, 1989. S. N. Bhatia, P. Chowdhury, S. Gupta, and B. D. Padalia, Phys. Rev. B, Vol. 66, pp. 214523, 2002. Z. Z. Sheng, L. Sheng, H. M. Su, and A. M. Hermann, Appl. Phys. Lett., Vol. 53, pp. 2686, 1988. R. M. Hazen, L. W. Finger, R. J. Angel, C. T. Prewitt, N. L. Ross, C. G. Hadidiacos, P. J. Heaney, D. R. Veblen, Z. Z. Sheng, A. El Ali, and A. M. Hermann, Phys. Rev. Lett., Vol. 60, pp. 1657, 1988. F. Goutenoire, A. Maignan, G. Van Tendello, C. Martin, C. Michel, M. Hervieu, and B. Raveau, Solid State Commun., Vol. 90, pp. 47, 1994. A. Poddar, B. Bandyopadhyay, and B. Chattopadhyay, Physica C, Vol. 390, pp. 120, 2003. Y. Idemoto, M. Matsuzawa, N. Koura, K. Takeuchi, J. W. Richardson Jr., and ChunK. Loong, Solid State Commun., Vol. 131, pp. 513, 2004. 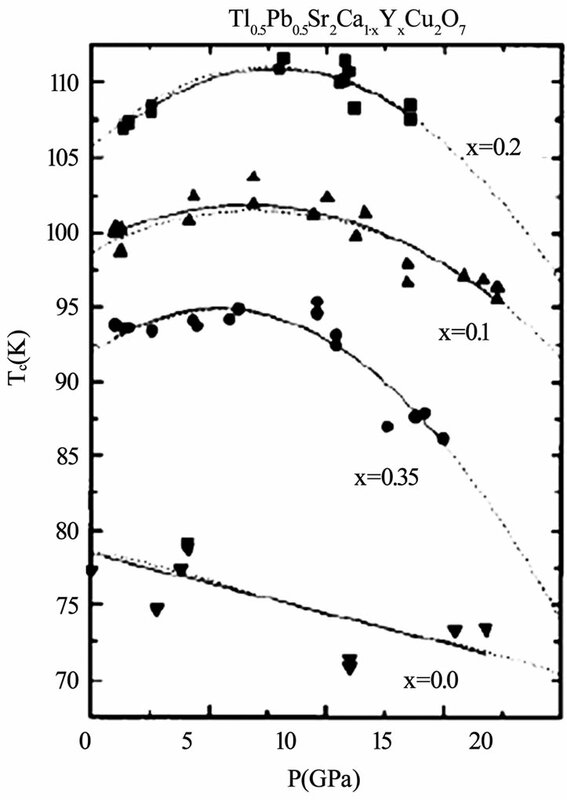 T. Tatsuki, A. Tokiwa-Yamamoto, T. Tamura, X. J. Wu, Y. Moriwaki, S. Adachi, and K. Tanabe, Physica C, Vol. 273, pp. 65, 1996. Y. X. Jia, C. S. Lee, and A. Zettl, Physica C, Vol. 234, pp. 24, 1994. C. Y. Huang, H. H. Tai, and M. K. Wu, Mod. Phys. Lett. B, Vol. 3, pp. 525, 1989. M. Yang, Y. H. Kao, Y. Kin, and K. W. Wong, Phys. Rev. B, Vol. 50, pp. 13653, 1994. A. Podder, P. Mandal, A. N. Das, and B. Ghosh, Phys. Rev. B, Vol. 44, pp. 2757, 1991. Misra, Y. Song, P. P. Crooker, J. R. Gaines, and A. H. Cardona, Appl. Phys. Lett., Vol. 59, pp. 863, 1991. P. Bramley, S. M. Morley, C. R. M. Grovenor, and B. Pecz, Appl. Phys. Lett., Vol. 66, pp. 517, 1995. D. Weaver, M. E. Reeves, G. P. Summers, and R. J. Soulen, Appl. Phys. Lett., Vol. 63, pp. 252, 1993. W. L. Holstein, L. A. Parisi, D. W. Face, X. D. Wu, S. R. Foltyn, and R. E. Muenchausen, Appl. Phys. Lett., Vol. 66, pp. 517, 1995. A. H. Cardona, H. Suzuki, T. Yamashita, K. H. Young, and L. C. Bourne, Appl. Phys. Lett., Vol. 62, pp. 411, 1993. Sundaresan, H. Asada, A. Crisan, J. C. Nie, H. Kito, A. Iyo, Y. Tanaka, M. Kusunoki, and S. Ohshima, IEEE Trans. Appl. Supercond., Vol. 13, pp. 2913, 2003. J. Miller, J. G. Hu, J. D. Hettinger, K. E. Gray, J. E. Tkaczyk, J. Deluca, P. L. Karas, J. A. Sutliff, and M. F. Garauskas, Appl. Phys. Lett., Vol. 63, pp. 556, 1993. J. Y. Juang, J. H. Horng, S. P. Chen, C. M. Fu, K. H. Wu, T. M. Uen, and Y. S. Gou, Appl. Phys. Lett., Vol. 60, pp. 885, 1995. A. Sundaresan, H. Asada, A. Crisan, J. C. Nie, H. Kito, A. Iyo, T. Tanaka, M. Kusunoki, and S. Oshima, Physica C, Vol. 388, pp. 473, 2003. Iyo, Y. Ishiura, Y. Tanaka, P. Badica, K. Tokiwa, T. Watanabe, and H. Ihara, Physica C, Vol. 370, pp. 205, 2002. W. Mexner, J. Hoffmann, S. Heede, K. Heinemann, H. C. Freyhardt, F. Ladenberger, and E. Schwarzmann, Z. Phys. B, Vol. 101, pp. 181, 1996. N. Zheng, J. D. Johnson, A. R. Jones, A. M. Campbell, W. Y. Liang, T. Doi, M. Okada, and K. Higashyama, J. Appl. Phys., Vol. 77, pp. 5287, 1995. R. T. Liu, S. L. Yan, L. Fang, and M. He, Supercond. Sci. Technol., Vol. 14, pp. 948, 2001. R. S. Liu, D. N. Zheng, J. W. Loram, K. A. Mirza, A. M. Campbell, and P. P. Edwards, Appl. Phys. Lett., Vol. 60, pp. 1019, 1992. T. Jover, H. Wilhelm, R. J. Wijngarden, and R. S. Liu, Phys. Rev. B, Vol. 55, pp. 11832, 1997. R. S. Liu, P. P. Edwards, Y. T. Huang, S. F. Wu, and P. T. Wu, J. Solid State Chem., Vol. 86, pp. 334, 1990. R. S. Liu and P. P. Edwards, Physica C, Vol. 185, pp. 655, 1991. R. Abd-Shukor, B. Yatim, and R. S. L. Lau, J. Mater. Sci. Lett., Vol. 16, pp. 818, 1997. R. Abd-Shukor and K. S. Tee, J. Mater. Sci. Lett., Vol. 17, pp. 103, 1997. R. Abd-Shukor and N. A. N. Jaffar, J. Mater. Sci., Vol. 10, pp. 677, 1999. M. P. Siegal, E. L. Venturini, P. P. Newcomer, B. Morosin, D. L. Overmyer, F. Dominguez, and R. Dunn, Appl. Phys. Lett., Vol. 67, pp. 3966, 1995. H. Kotegawa, Y. Tokunga, K. Ishida, G. Q. Zheng, Y. Kitwka, A. Iyo, Y. Tanaka, and H. Ihara, Phys. Rev. B, Vol. 65, pp. 18504, 2002. H. Yamauchi and M. Karppinen, J. Supercond., Vol. 11, pp. 43, 1998. A. Iyo, Y. Aizawa, Y. Tanaka, M. Tokumoto, K. Tokiwa, T. Watanabe, and H. Ihara, Physica C, Vol. 357, pp. 324, 2001. O. Heiml, G. Gritzner, S. Tonies, H. W. Weber, J. Keckes, and B. Ortner, Supercond. Sci. Technol., Vol. 15, pp. 1592, 2002. R. E. Gladyshevskii, E. Bellingeri, F. Marti, and R. Flukiger, J. Supercond., Vol. 11, pp. 109, 1998. M. Paranthaman, J. R. Thompson, A. Goyal, A. J. Pedraza, and M.Kroeger, Appl. Phys. Lett., Vol. 67, pp. 294, 1995. A. M. Panich, S. D. Goren, L. Frenkel Ben-Yakar, M. Eder, and G. Gritzner, Physica C, Vol. 356, pp. 129, 2001. Hase, N. Hamada, A. Iyo, N. Terada, Y. Tanaka, and H. Ihara, Physica C, Vol. 357, pp. 153, 2001. L. P. Cook, W. Wong-Ng, and P. Paranthaman, J. Res. Natl. Inst. Stand. Technol., Vol. 101, pp. 675, 1996. T. Kaneko, T. Wada, H. Yamauchi, and S. Tanaka, Appl. Phys. Lett., Vol. 56, pp. 1281, 1990. A. Kikuchi, K. Inoue, and Tachikawa, Physica C, Vol. 337, pp. 180, 2000. Z. F. Rent and J. H. Wang, Appl. Phys. Lett., Vol. 61, pp. 1715, 1992. Chiang, C. Y. Shei, S. F. Wu, and Y. T. Huang, Appl. Phys. Lett., Vol. 58, pp. 2435, 1991. S. Adachi, T. Shibata, T. Tatsuki, T. Tamura, K. Tanabe, S. Fujihara, and T. Kimura, Physica C, Vol. 324, pp. 15, 1995. W. Konig, M. Mair, and G. Gritzner, J. Supercond., Vol. 11, pp. 107, 1998. Y. T. Huang, S. F. Wu, C. K. Chiang, and W. H. Lee, Appl. Phys. Lett., Vol. 57, pp. 2354, 1991. M. Enengl, E. Kuzmann, Z. Homonnay, and G. Gritzner, Physica C, Vol. 377, pp. 565, 2002. T. Kamo, T. Toi, A. Soeta, T. Yuasa, N. Inoue, K. Aihara, and S. Matsuda, Appl. Phys. Lett., Vol. 59, pp. 3186, 199. T. Doi, T. Nabatame, T. Kamo, and S. P. Matsuda, Supercond. Sci. Technol., Vol. 4, pp. 488, 1991. R. Zalecki, A. Kolodziejczyk, J. Chmist, W. Konig, and G. Gritzner, Physica C, Vol. 341, pp. 2049, 2000. R. J. McNeely, J. A. Belot, B. J. Hinds, T. J. Marks, J. L. Schindler, X. F. Zhang, and D. J. Miller, Appl. Phys. Lett., Vol. 71, pp. 1243, 1997. T. L. Aselage, E. L. Venturini, and S. B. Van Deusen, J. Appl. Phys., Vol. 75, pp. 1023, 1994. T. L. Aselage, E. L. Venturini, S. B. Van Deusen, T. J. Headley, M. O. Eatough, and J. A. Voigt, Physica C, Vol. 203, pp. 25, 1992. Oshima, T. Atou, M. Kikuchi, and Y. Syono, Physica C, Vol. 282, pp. 827, 1997. A. Iyo, Y. Tanaka, Y. Ishiura, M. Tokumoto, K. Tokiwa, T. Watanabe, and H. Ihara, Supercond. Sci. Technol., Vol. 14, pp. 504, 2001. J. L. Gonzalez, E. V. L. de Mello, E. S. Yugue, M. T. D. Orlando, and E. Baggio-Saitovitch, Physica C, Vol. 384, pp. 102, 2003. Y. S. Sung, X. F. Zhang, P. J. Kostic, and D. J. Miller, Appl. Phys. Lett., Vol. 69, pp. 3420, 1996. A. Kikuchi, T. Kinosita, N. Nishikawa, S. Komiya, and K. Tachikawa, Jpn. J. Appl. Phys., Vol. 27, pp. L167, 1995. M. Engel and G. Gritzner, Supercond. Sci. Technol., Vol. 16, pp. 956, 2003. N. M. Hamdan, Kh. A. Ziq, and A. S. Al-Harthi, Physica C, Vol. 314, pp. 125, 1999. Th. Hofinger, M. Lomello-Tafin, J. L. Jorda, Ph. Galez, M. Couach, R. E. Gladyshevskii, and J. L. Soubeyroux, Physica C, Vol. 351, pp. 53, 2001. M. H. Eder and G. Gritzner, Supercond. Sci. Technol., Vol. 18, pp. 87, 2005. A. I. Abou-Aly, I. H. Ibrahim, and R. Awad, J. Mater. Sci., Vol. 35, pp. 2893, 2000. A. I. Abou-Aly, R. Awad, and N. H. Mohammad, J. Mag. & Magnetic Materials, Vol. 226, pp. 328, 2001. Gritzner, M. Eder, A. Cigan, J. Manka, G. Plesch, and V. Zrubec, Physica C, Vol. 366, pp. 169, 2002. E. Kuzmann, M. Mair, Z. Klencar, A. Vertes, Z. Homonnay, and G. Gritzner, Physica C, Vol. 319, pp. 12, 1999. N. M. Hamdan and J. Low Temp. Phys., Vol. 117, pp. 1187, 1999. S. Isber, R. Awad, A. I. Abou-Aly, M. Tabbal, and J. M. Kaouar, Supercond. Sci. Technol., Vol. 18, pp. 311, 2005. Y. Li, E. Baggio-Saitovitch, Y. B. Wang, G. H. Cao, N. Chen, Z. X. Zhao, and L. Wei, Physica C, Vol. 315, pp. 129, 1999. M. Kubberger and G. Gritzner, Physica C, Vol. 390, pp. 263, 2003. R. Awad, N. S. Aly, I. H. Ibrahim, A. I. Abou-Aly, and A. I. Saad, Physica C, Vol. 341, pp. 685, 2000. W. L. Holstein, L. A. Parisi, C. Wilker, and R. B. Flippen, Appl. Phys. Lett., Vol. 60, pp. 2014, 1992. K. F. Renk and G. Saemann-Ischenko, Appl. Phys. Lett., Vol. 65, pp. 1451, 1994. Chou, H. S. Chen, A. R. Kortan, L. C. Kimerling, F. Thiel, and M. K. Wu, Appl. Phys. Lett., Vol. 58, pp. 2836, 1991. A. Piehler, R. Low, J. Betz, R. Schonberger, and K. F. Renk, J. Appl. Phys., Vol. 74, pp. 6437, 1993. V. handy, A. Maignan, C. Martin, F. Warmont, and J. Provost, Phys. Rev. B, Vol. 56, pp. 130, 1997. P. Marsh, R. M. Fleming, M. L. Mandich, A. M. Desantolo, J. Kwo, M. Hong, and L. J. Martines-Miranda, Nature, Vol. 334, pp. 141, 1988. Mihailovic, T. Mertelj, K. F. Voss, A. J. Heeger, and N. Herron, Phys. Rev. B, Vol. 45, pp. 8016, 1992. Scherbel, M. Mans, H. Schneidenind, U. Kaiser, J. Biskupek, F. Schmidl, and P. Seidel, Phys. Rev. B, Vol. 70, pp. 104507, 2004. T. Nabatame, S. Koike, O. B. Hyun, I. Hirabayashi, H. Suhara, and K. Nakamura, Appl. Phys. Lett., Vol. 65, pp. 776, 1994. H. Takei, H. Kugai, Y. Torii, and K. Tada, Physica C, Vol. 210, pp. 109, 1993. T. Nabatame, J. Sato, Y. Saito, K. Aihara, T. Kamo, and S. Matsuda, Physica C, Vol. 193, pp. 39, 1992. M. Paranthaman, M. Foldeaki, R. Tello, and A. M. Hermann, Physica C, Vol. 219, pp. 413, 1994. Q. Jin, S. Adachi, X. J. Wu, H. Yamauchi, and S. Tanaka, Physica C, Vol. 223, pp. 238, 1994. X. J. Wu, S. Adachi, C. Q. Jin, H. Yamauchi, and S. Tanaka, Physica C, Vol. 223, pp. 243, 1994. X. J. Wu, C. Q. Jin, S. Adachi, and H. Yamauchi, Physica C, Vol. 224, pp. 175, 1994. H. Ihara, Adv. Supercond., Vol. 7, pp. 255, 1995. H. Ihara, Solid State Phys., Vol. 35, pp. 301, 2001. M. Karppinen, H. Yamauchi, Y. Morita, M. Kitabatake, T. Motohashi, R. S. Liu, J. M. Lee, and J. M. Chen, Journal of Solid State Chemistry, Vol. 177, pp. 1037, 2004. H. Ihara, K. Tokiwa, H. Ozawa, M. Hirabayashi, A. Negishi, H. Matuhata, and Y. S. Song, Jpn. J. Appl. Phys., Vol. 33, pp. L503, 1994. H. Ihara, K. Tanaka, Y. Tanaka, A. Iyo, N. Terada, M. Tokumoto, M. Ariyama, I. Hase, A. Sundaresan, N. Hamada, S. Miyashita, K. Tokiwa, and T. Watanabe, Physica C, Vol. 341, pp. 487, 2000. H. Ihara, Physica C, Vol. 364, pp. 289, 2001. Tokiwa, H. Aota, C. Kunugi, K. Tanaka, Y. Tanaka, A. Iyo, H. Ihara, and T. Watanabe, Physica B, Vol. 284, pp. 1077, 2000. Tanaka, A. Iyo, N. Terada, K. Tokiwa, S. Miyashita, Y. Tanaka, T. Tsukamoto, S. K. Agarwal, T. Watanabe, and H. Ihara, Phys. Rev. B, Vol. 63, pp. 064508, 2001. 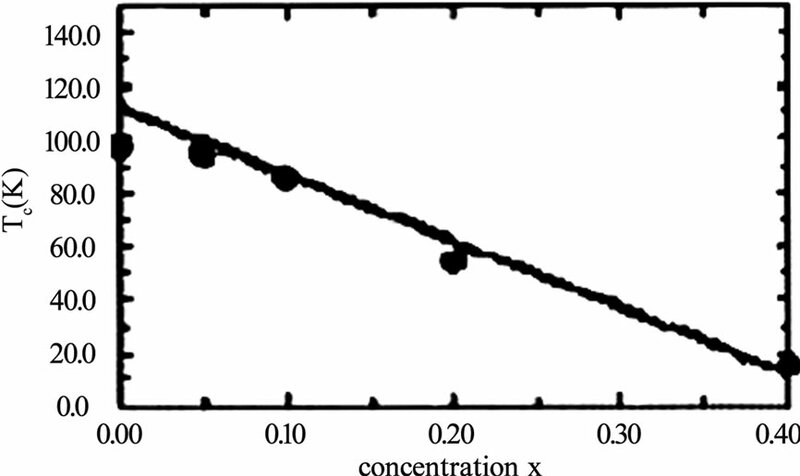 T. Shibata, T. Tatsucki, S. Adachi, K. Tanabe, S. Fujihara, and T. Kimura, Physica C, Vol. 353, pp. 200, 2001. Nawazish A. Khan, Y. Sekita, H. Ihara, and A. Maqsood, Physica C, Vol. 377, pp. 43, 2002. Tanaka, A. Iyo, Y. Tanaka, K. Tokiwa, M. Tokumoto, M. Ariyama, T. Tsukamoto, T. Watanabe, and H. Ihara, Physica B, Vol. 284, pp. 1081, 2001. H. Ihara, Y. Sekita, F. Tateai, N. A. Khan, K. Ishida, E. Harashima, T. Kojima, H. Yamamoto, K. Tanaka, Y. Tanaka, N. Terada, and H. Obara, IEEE Trans. Appl. Supercond., Vol. 9, pp. 1551, 1999. A. Khan, Y. Sekita, F. Tateai, T. Kojima, K. Ishida, N. Terada, and H. Ihara, Physica C, Vol. 320, pp. 39, 1999. Nawazish A. Khan and A. A. Khurram, Appl. Phys. Lett., Vol. 86, pp. 152502, 2005. Nawazish A. Khan and Shahid Nawaz, IEEE Trans. Appl. Supercond., Vol. 16, pp. 1, 2006. S. K. Agarwal, A. Iyo, K. Tokiwa, Y. Tanaka, K. Tanaka, M. Tokumoto, N. Terada, T. Saya, M. Umeda and H. Ihara, Phys. Rev. B, Vol. 58, pp. 9504, 1998. Nawazish A. Khan and G. Husnain, Physica C, Vol. 436, pp. 51, 2006. Nawazish A. Khan, Asim Javaid, A. A. Khurram, and Naghma Haider, Physica C, Vol. 425, pp. 90, 2005. T. Watanabe, S. Miyashita, N. Ichioka, K. Tokiwa, K. Tanaka, A. Iyo, Y. Tanaka, and H. Ihara, Physica B, Vol. 284, pp. 1075, 2000. Terada, K. Tanaka, Y. Tanaka, A. Iyo, K. Tokiwa, T. Watanabe, and H. Ihara, Physica B, Vol. 284, pp. 1083, 2000. H. Ihara, K. Tanaka, Y. Tanaka, A. Iyo, N. Terada, M. Tokumoto, F. Tateai, M. Kawamura, K. Ishida, S. Miyashita, and T. Watanabe, Physica B, Vol. 284, pp. 1085, 2000. A. A. Khurram and Nawazish A. Khan, Supercond. Sci. Technol., Vol. 19, pp. 679, 2006. A. Khan and A. Hussain, Physica C, Vol. 449, pp. 21, 2006. T. Kawashima, Y. Matsui, and E. Takayama-Muromachi, Physica C, Vol. 224, pp. 69, 1994. H. Kito, A. Iyo, M. Hirai, A. Crisan, A. Tokumoto, S. Okayasu, M. Sasase, and H. Ihara, Physica C, Vol. 378, pp. 329, 2002. M. Hirai, A. Iyo, H. Kito, A. Crisan, K. Tokiwa, T. Watanabe, J. Arai, and Y. Tanaka, Physica C, Vol. 388, pp. 427, 2003.